Lamivudine and zidovudine are highly selective inhibitors of reverse transcriptase of HIV-1 and HIV-2. Lamivudine is synergistic with respect to inhibition of zidovudine in HIV replication in cell culture. Both drugs are metabolised successively to intracellular kinases 5′-triphosphate (TP). 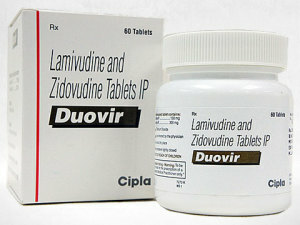 Lamivudine-TP and zidovudine-TP are substrates for HIV reverse transcriptase and competitive inhibitors of this enzyme. However, the antiviral activity of drugs is due primarily to their inclusion in the circuit monophosphate forms of viral DNA, causing chain termination occurs. Lamivudine and zidovudine triphosphates have significantly lower affinity for DNA polymerases of human cells. In vitro lamivudine exhibits low cytotoxicity against lymphocytic and monocytic-macrophage colonies and a number of precursor cells in the bone marrow. Hence, lamivudine has a wide therapeutic index.